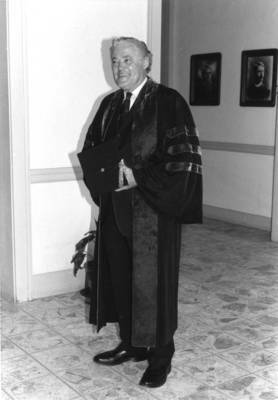 "Dr. Gilman, Commencement, Chapman College, 1984"
Commencement speaker, Chapman College, Orange, California, May 20, 1984. Dr. Richard C. Gilman, president of Occicental College, spoke on topic "In Memory of Ebenezer Smalley" and also was awarded honorary degree of Doctor of Humane Letters. BW photographs; 6.5" x 4.5"